The first quiz below is designed to test your basic electrical knowledge. There are 20 questions, each with a single correct answer. If you don’t get everything right at the first attempt, have another go. The following quiz is designed to test your basic electrical knowledge. We all come into contact with electrical items on a daily basis, so a certain amount of background knowledge is required. Why not sit one of our PAT Training Courses to help you get some hands-on experience, contact us here to find out more. What is measured in Amps (Amperes)? Voltage is a measure of what? What is Resistance in a circuit? Power (Watts) is a measure of what? What does AC stand for in electrical systems? What is the cartridge fuse in a plug specifically designed to protect? What is the current standard colour of the live wire in a plug? What is the current standard colour of the neutral wire in a plug? What is the current standard colour of the earth wire in a plug? 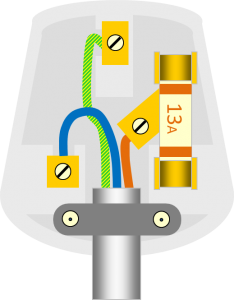 What happens if the terminal screws inside the plug become loose? What is the nominal voltage available from a standard 3-pin socket outlet e.g. a wall socket? Following harmonisation with the rest of Europe, the electrical supply in the UK is now 230V, having been lowered slightly from 240V. This was to allow appliances to be used in different countries without the need for significant changes to the appliance design. When using an extension reel, how much cord should you pull off the reel before using it? How many 3000W kettles can you run off a standard 13Amp 4-way extension lead, at the same time? For standardisation, a lamp fitted with a 12W energy saving bulb should carry which size fuse in the plug? For standardisation, which fuse should be used for a 2200W kettle? When an appliance isn’t in use you should do what? What should you do prior to plugging a new appliance into the socket? Who is responsible for the safety of electrical equipment on a daily basis? Which one of the following pairs of fuses is correct? Which of the following BS1363 plugs is correct? There are many aspects of a standard BS1363 plug we need to be aware of, otherwise the plug may not be safe. Whilst most people notice the incorrect wiring in a plug, not everyone sees the missing the cord grip. The following quiz goes into more detail surrounding In-service Inspection & Testing of Electrical Equipment (PAT Testing) and starts to put a few technical ideas and terms into the mix. Much of what you see may be new to you, so we don’t expect you to pass first time, but the reason for the correct answer is displayed after each answer If you have a few attempts you will start to understand it a bit more. The following quiz is designed to test your existing subject, background and general knowledge. Please don’t expect it to be easy – it’s not!! We don’t expect you to get 100% at the first attempt, but if you keep trying you will improve your knowledge. Take your time and read the questions thoroughly. Many of the answers can be found on this website. The IET are widely seen as the governing body of the PAT Testing industry and for many years have published a code of practice. The latest version is the 4th Edition which was launched in November 2012 and contains a large amount of general information regarding PAT Testing and related subjects in the workplace. Anyone who is serious about PAT Testing (either as a contractor or in-house) should have a copy of this book to refer to whenever necessary. Over the years, the amount of PAT Testing being carried out has increased and in some cases is out of control. A study by the HSE in 2012 identified that in some work environments, inspection and testing of electrical equipment (PAT Testing) can be kept to a minimum, as the associated risks are minimal. This document helps to describe the typical PAT Testing requirements for a low-risk environment e.g. an office.